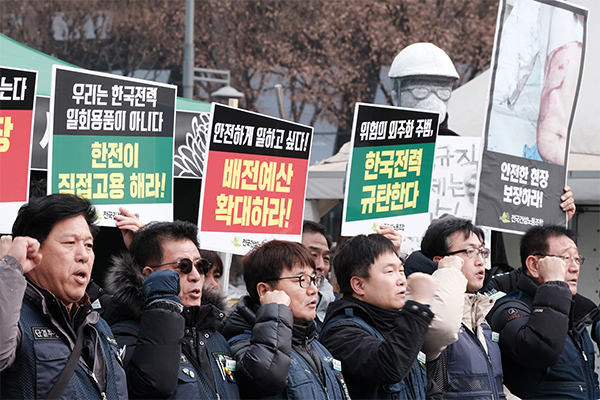 13 electrical workers hired by a power distribution subcontractor to the Korea Electric Power Corporation(KEPCO) in the city of Daejeon were dismissed on January 10, citing the budget cut in the KEPCO’s power distribution operation. The dismissed skilled workers were replaced with the new recruits who do not have the experiences at work and the family members of the owner of the subcontractor. Concerns were raised about the possible occurrence of bigger accidents due to the reduction of skilled workers, considering the reality that even skilled electrical workers with more than 20 years of work experiences handling the 22,900 voltage live power lines happen to meet with electric shock injury accidents because of manpower shortage and assigned workload. Contingent electrical workers argued that “the dangerous work is being outsourced, and the work safety is neglected due to the manpower shortage and assigned workload.” They complained that “because of the KEPCO’s power distribution budget cut, jobs of the electric workers are at stake.” The contingent electrical workers plan to go on a strike on January 18 to demand KEPCO to “stop the outsourcing of death” and “increase the power distribution budget”. According to the labor union, 19 electrical workers lost their lives and 19 were amputated with electric shock for the period from 2010 up until May last year. According to the industrial accident report filed by KEPCO for the past 10 years since 2009, 1,529 accidents are involved in contingent electrical workers hired by its subcontractors and 38 accidents in KEPCO’s regular workers.